Fifty-plus canvassers gathered early Saturday at a bare bones campaign office in Ashburn. Their task: canvass their assigned neighborhoods looking for unidentified Democrats and finding out what issues mattered to them. It’s all part of a broad voter identification program going on throughout Virginia’s 10th Congressional District. 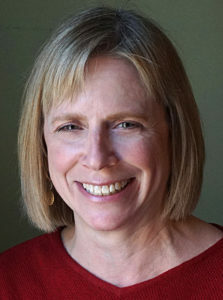 The goal is to find the new voters who will help beat Barbara Comstock in 2018 and also turn the Virginia Legislature blue in 2019. While 50+ canvassers is common for the Get-Out-the-Vote (GOTV) efforts that start two weeks before major elections, a crowd this size, months before the election is new. “We always had a good turnout for GOTV, but the difference now is people coming to events like this,” explained Todd Smyth, who had come out from Kingstowne to participate. Smyth is a veteran canvasser, but this is the first year he has seen this kind of event. The data gathered at these canvasses will enable the winner of the CD-10 primary to start on day one with good data on where the voters are and what matters to them. State Delegate David Reid (32nd district) was there to send the group off. Reid knows first-hand the positive effect door-to-door canvassing can have on a campaign. He credits his success in the 2018 election to direct voter interaction. Before the GOTV effort began last fall, Reid’s campaign had knocked on 71,500 doors. 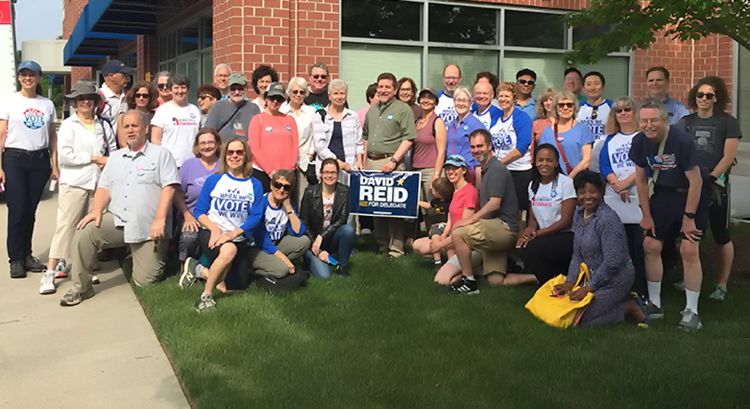 Reid had knocked on 8,000 doors himself, but it was the large groups of volunteers from all over the area that allowed for such comprehensive coverage. “It started in November with about 40 to 50 people calling me and showing up asking to help, in December it was 100 and by the end of January we had 300 volunteers. Reid and his campaign manager worked to schedule canvasses with each group. They staged the events out of his house, so the out-of-town canvassers would feel welcome. It worked, Reid won with 59% of the vote. “At first we thought the surge of volunteers would diminish, like a New Year’s resolution fades away, but it didn’t,” said Reid. The photo above the story is of fifty-plus canvassers gathering with Delegate David Reid standing behind a sign left over from his last campaign. / Photo by Stephanie Witt Sedgwick. Really great turn out from all over. DC, Alexandria, Arlington, Fairfax and Loudoun. I heard several people say they were disappointed more from their group didn’t make it but this was a great turn out and this is the way to do it. Many hands make light work. I think we surprised and overwhelmed the organizers a bit but they got us all out the door. The updates to the electronic app (MiniVAN) many of us used, are working great now. Makes it much easier. I think we will eventually be able to get links ahead of time and when we get close to the event, Mobilize should check us in automatically and allow us to download our list, grab some lit and go. We check everything off on our phones or tablets and sync when we are done. No need to go back to the launch spot but some of us did get together for lunch after. I think a printed map of the area we walk would help, even if you are using MiniVAN and they do have printed lists for those who need it. It’s great exercise and good therapy. Please join us next time.